They played a championship game in Brooklyn on Wednesday night, at one of those raucous little gyms that holds 1,700 people and, when packed to the gills, feels like it might collapse in on itself at any moment. It was contested to determine the winner of the Northeast Conference, a conflagration of small schools that hardly seems like it belongs in Division I at all, and it was played at Long Island University, which is situated across the street from a diner renowned for its cheesecakes, and an Applebee’s that serves adequate riblets. LIU has a storied and yet largely forgotten basketball tradition: Under legendary coach Clair Bee, the Blackbirds — probably the best team in America at the time — boycotted the 1936 Olympic trials in protest of Hitler’s policies. Back then, the center of power in college basketball was located almost exclusively in New York City. Now, there are 344 RPI-rated Division I college basketball teams spread out across America, and there are perhaps six or eight schools who are considered legitimate contenders for a national championship, and most of those teams are stacked with NBA prospects who will never progress far enough in college that they’ll actually be required to focus on their major. To me, mid- to low-major college basketball has become the most enjoyable incarnation of the sport, and I know that makes me sound like I wear an onion on my belt, but I don’t care, because at Long Island’s gym on Wednesday night, something insanely true unfolded before our eyes. This was a pure New York crowd: Spike Lee even showed up, and people booed injuries to opposing players from Robert Morris, and they booed the Robert Morris cheerleaders, and they booed the officials for slowing down the game, and the whole atmosphere was perched on that knife’s edge between passion and danger. At one point, I counted seven players on the hardwood chasing after a loose ball. LIU’s slick little point guard, Jason Brickman, is a 5-foot-10 computer science major; the Blackbirds’ best player, a skilled forward named Julian Boyd, nearly had to quit the sport due to a heart ailment. The odds of anyone in this game playing in the NBA are kind of unfathomable. 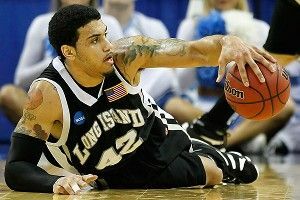 In the end, Long Island pulled away and won 90-73, advancing to the tournament for the second consecutive year. When it was over, the students rushed the floor, and it didn’t feel like one of those forced celebrations, as it does when, say, the last-place team in the ACC upsets a Top 25 school in January. In these mid-major championship games, you can feel the stakes. The urgency and the noise and the effort are tremendous, even when the actual basketball isn’t. Anything is possible in March, of course, but I cannot imagine Long Island will actually win an NCAA tournament game. Last year, the Blackbirds were a 15-seed and drew North Carolina in the first round; they will probably not get much of a better spot this year. The soft middle of the tournament is the place from which the upsets tend to spring: A 12 beats an overhyped 5, an 8 from a mid-major plays the lights out against a soft 1-seed. The tournament committee has gotten so canny with its seeding that the notion of a 16 ever beating a 1 (something that’s never happened) seems almost unfathomable at this point; a 15 hasn’t beaten in a 2 in more than a decade. But none of that matters, because LIU, like Western Kentucky and South Dakota State, like Lehigh and UNC-Asheville and Loyola, won its season already. This is the beauty of Championship Week. To me, it’s become the best week of them all.